In an exciting move to herald the OTT (Over-The-Top) entertainment revolution, HKBN and Television Broadcasts Limited (“TVB”) announced today the launch of myTV SUPER + fibre broadband super value bundles. By paying as low as only HK$148 a month, customers can take full advantage of HKBN’s hi-speed and reliable fibre network for an unprecedented enjoyment of thrilling, ultra-diverse entertainment content – and experience why HKBN is the leading platform for “Your home for fibre entertainment”. Bringing incredible bang-for-buck value, all bundles will feature 100Mbps, 500Mbps or 1000Mbps home fibre broadband service together with HKBN Wi-Fi mobile broadband, plus myTV SUPER TV box and mobile app. Through these bundles, customers can watch all their favourite programmes both at home on the big screen and on-the-go via their mobile devices. 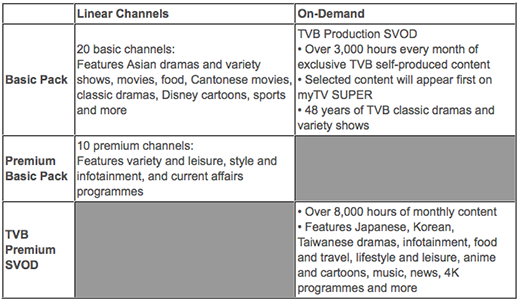 By choosing a designated bundle* with a 24-month service contract term, customers will enjoy both myTV SUPER’s Basic Pack (includes 20 channels plus 3,000 hours of TVB Production SVOD) along with the Premium Basic Pack (includes 10 premium channels featuring variety and leisure, style and infotainment, and current affairs programs); plus 8,000 hours of TVB Premium SVOD. To boost morale, HKBN is holding two Talent Meetings respectively for all Talents starting today in Hong Kong, and subsequently, in Guangzhou the following day. Both events will be attended by a combined number of all 2,400 HKBN Talents. And to mobilise the company’s goal of capturing 100,000 new customers over the next year, HKBN has allocated an additional $1 million towards special rewards (on top of the standard structure for salary and bonuses) for frontline Talents, as well as one additional day of paid leave for all HKBN Talents if target is achieved. Apart from broadband and myTV SUPER service bundles for residential customers, HKBN and TVB intend to extend their cooperation to the business and retail markets; both companies are currently in close discussions for it. HKBN is the largest provider of residential fibre broadband services (symmetrical 100Mbps to 1,000Mbps) in Hong Kong. With its world class fibre network covering all regions across the city, HKBN is more than capable of delivering 4K ultra HD programmes to not only redefine entertainment experiences for all customers, but also realise its platform promise of “Your home for fibre entertainment”.